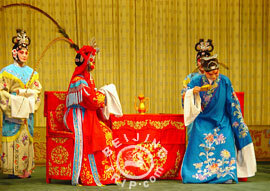 Beijing is the cradle of Beijing Opera, acrobatics, cross-talk, and story-telling. Beijing Opera is the quintessence of Chinese culture. It combines singing, dancing, music, art and literature, which endears itself to people home and overseas. Chinese acrobatics has won many awards at an international level and has amazed audiences throughout the world. In a cross-talk, performers use different ways to make you laugh. They may tell jokes, imitate, show stunts or sing in exaggerated ways. It is so comical that audiences can't help laughing. Story-telling (Pingshu) is deeply loved by local people. As a common practice, the teller has a paper fan in one hand and stands behind a table that has a block on. The block is used to call listeners' attention when he comes to the showdown of the story. With particular cadence and actions, it is quite interesting. Following are some recommended theaters and concert halls.